Wes Dunham and Sydney Collier’s Wentworth. Photo courtesy of Anna Collier. 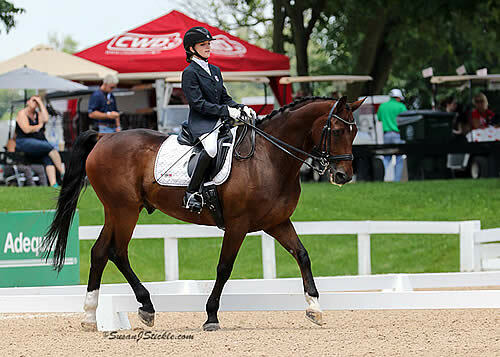 Lexington, Kentucky – July 15, 2015 – The 2015 Adequan/FEI North American Junior Young Rider Para-Dressage Championships began on July 15, 2015 with the FEI Jog. United States Para-Dressage horse and rider combinations included 2014 Alltech FEI World Equestrian Games athlete Sydney Collier (Ann Arbor, Mich.) and her own Wentworth in Grade Ib; rider Kate Shoemaker (Glendale, Ariz.) and her own Pacifec M in Grade III; and Cambry Kaylor (Lehi, Utah) with her own Markgaards Donnewind in Grade Ib. This is the inaugural year for the Para-Dressage Championships scheduled July 14-19. The Team Test begins on July 16, at 1 PM, followed by the Individual Test on July 18, at 8 AM, and finally the Freestyle Test on July 19, at 8 AM. Two countries including the United States and Canada are participating in the unprecedented Championships with riders representing Grade Ia, Ib, II, III, and IV. The United States is led by Chef d’Equipe Kai Handt with coach Wes Dunham.